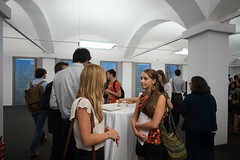 The Barcelona Graduate School of Economics inaugurated the 2013-14 academic year on September 25 at Caixaforum, home of board member institution "la Caixa" Savings Bank. 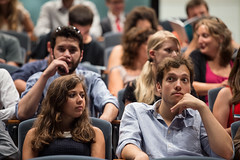 This year, 226 students from 63 different countries will join the Barcelona GSE to follow one of seven master programs in Economics with the ambition of becoming outstanding economists. 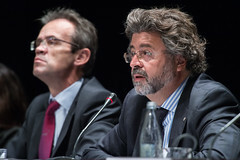 To inspire them at the outset of this challenging endeavor, the opening ceremony featured a lecture by Otmar Issing, Chairman of the Center for Financial Studies in Frankfurt, Germany and one of the architects of the Euro. A new paradigm for monetary policy? In his lecture, Prof. Issing spoke on the monetary policy challenges facing central banks around the world. His talk was informed by his years of experience as Chief Economist and Member of the Executive Board of the European Central Bank. "Greater flexibility and tolerance for inflation, closer coordination with fiscal policy at home and internationally with other central banks, and a broader mandate including financial stability are the main arguments for a reorientation of monetary policy," Prof Issing said. "The crisis – its causes and its consequences – has demonstrated that inflation targeting as the dominating concept has failed. All attempts at 'rescue' have ended in a more or less meaningless approach," he said. Professor Issing reflected that what may be called for now is not a new paradigm for the conduct of monetary policy, but rather a return to what he called "lost or ignored principles." "How long will we have to wait until the neglect of money and credit in monetary theory and policy will be understood as the major source of macro policy mistakes?" he asked. "How many speeches and papers by central bankers are presented in which the terms money or credit are not even mentioned? Considering the developments that have taken place over the decades, one should expect that the time of “monetary” macroeconomics and “monetary” policy without “money and credit” will come to an end. Hopefully, this will happen before a new and probably even deeper crisis sets in," he said. 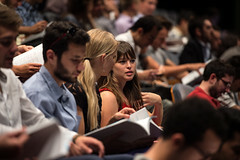 In addition to the inaugural lecture by Prof. Issing, the Opening Ceremony was an opportunity for several key members of the Barcelona GSE community to welcome the new students, including: Dr. Montse Farell, UAB Vicerector for Economy and Organization; Prof. Antoni Bosch-Domènech, UPF Vicerector for Finance and Strategic Projects; and Barcelona GSE Board members Mr. Jordi Gual, Chief Economist at "la Caixa" and Mr. Antoni Castellà, Catalan Secretary for Universities and Research. 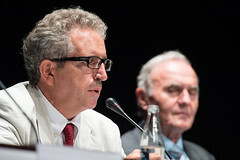 Professor Ramon Marimon, Chairman of the Barcelona GSE Board of Trustees, presided over the Opening Ceremony and also offered some remarks to the new students about the year ahead. "You're going to have fun this year, but you're going to have to work very hard," he said. "The time is going to pass very fast, but as we have seen last year when we had the first gathering of Barcelona GSE Alumni, it's an experience for life...You will have a network of people from many different countries. Working together this year, you will come to understand how people approach problems in different forms. This is a very unique experience that the Barcelona GSE is going to provide for you."